I use AppBrain because it provides a nice site, and it makes it really easy to install apps onto my phone. Additionally, I'm finding that many bloggers that are reviewing apps are putting links to the AppBrain page for the app in their posts. This makes it really easy to mark something for install while I'm at my computer reading the blog posts, and then install it when I get a chance. Their app (an alternative to the Playstore app) enables you to skip single (or all) updates on a per-app-base, which keeps your list of "pending updates" quite clean. For installation, you will be redirected to Google Play. In the past, AppBrain had a separate app for this called the "Fast Web Installer", but unfortunately this app was banned by Google. So even for batch updates, the Playstore app will now be opened for each app separately (not AppBrains fault). Still, I count their Website as a much better alternative to the Google Play website – and the same is to be said for their app, though for installations it has to redirect you as described above. There are actually several alternatives to the 'official' Google Android market (aka Play Store). I personally like to search for new apps from my PC browser, and a bit less from my phone. Most (all?) of the markets nowadays offer both, via a dedicated phone-app that you'll have to install, except from the official one which is already there. Until, well, yesterday, the 'official' market would not have been available from your PC (meaning: on a PC web browser). Now it is, with a neat push-to-your-phone one click installation that is taking away one of the advantages of the competition (see AppBrain). The alternative markets, though, have still their peculiarities. I'll make a short summary but don't expect it to highlight all of the differences. Some markets (e.g. AndSpot) do not offer very specific features to users, but try to gather developers by offering advanced features such as easy stats. F-Droid they distribute FOSS open source packages that pass audit and verification to ensure that code have no malicious parts. GetJar: my latest discovery. Quite a lot of apps, and they have specials ("GOLD") commercial apps for free. Extremely interesting platform for developers, since they seem to offer above-the-average marketing and PS activities! I'll add that there's a market for Adult Apps too now; and a lot of review/forum sites will link to one or more of these markets, e.g., AndroidTapp or AndroidPit AndroLib. I suggest you click on some of these links and see for yourself if the look/applications suit your style! Thanks to various sources, in particular this thenextweb.com article, and a lot of other stackexchange editing! aproov: a quite different web look. Register to download via a specific phone app. I've been using F-Droid, which is a smallish repository focused on free and open source tools. Not all encompassing by any means but one of the few that is explicit about showing you the license before you download an app. F-Droid compiles the packages from the sources. This adds a level of security, as it makes sure nothing was "sneaked into". The draw-back is, you cannot simply cross-update apps between the F-Droid main repo and other sources. Compiling the sources themselves, they also often throw out "binary blobs" and other unfree material (i.e. included modules from proprietary sources). In many cases, this means the advertisement stuff being removed. This again increases security (and privacy). But in some cases it has the draw-back of some functionality being broken, if the removed part was e.g. stuff enabling specific Google services, such as maps. Next to its main repository, F-Droid offers several others2. Developers can provide their own "channel", e.g. for Beta versions. A nice way also for companies or organizations to keep together groups of apps their members are supposed to use. 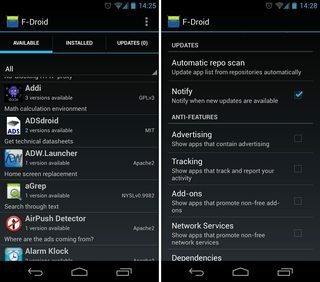 f-droid's Preferences allow you to screen apps by various traits: whether they contain advertising, track your activity, or promote non-free add-ons, among others. While I miss the lack of user ratings on f-droid, and f-droid app versions sometimes trail behind those on Google Play, the fact that I can be sure that anything on f-droid is free, open-source, and not a freaking PITA, is more than enough to recommend its use. 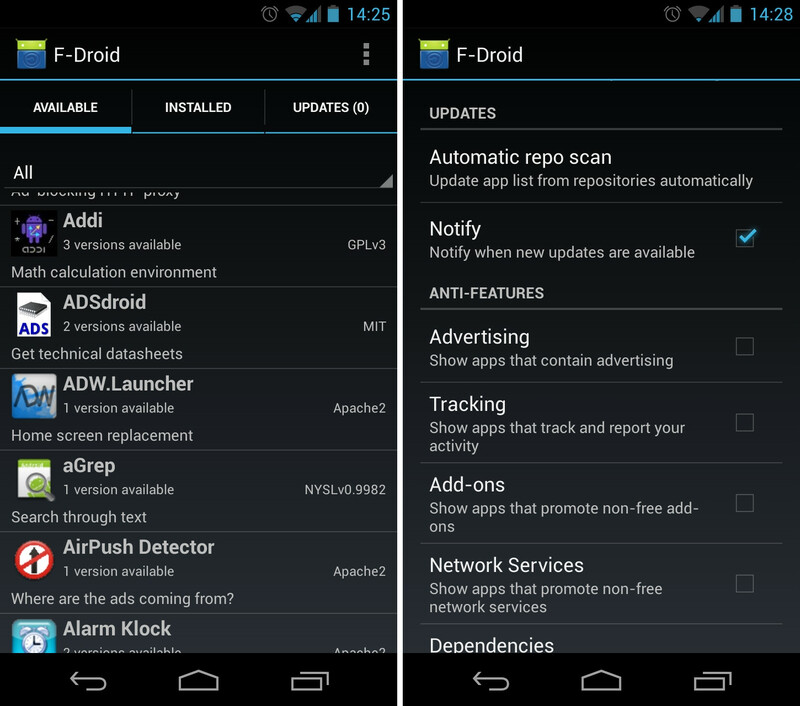 F-Droid apps are guaranteed open source, ad-free, tracking-free. That means smaller apps that don't waste your bandwidth for anti-features. More details on F-Droid can also be found at Wikipedia. Interesting fact: F-Droid is a fork of Aptoide3. The Amazon Appstore (download link). Using the Amazon Appstore from an "Unsupported Region"
Don't forget about GetJAR. :-) This market got its first big break when Rovio announced Angry Birds would be exclusive to them when it first launched. AppsZoom is browsable from your desktop, and gives you downloads, ratings, and reviews. Download via QR barcode, links emailed to you mobile, or instructions to find in the Android Market. 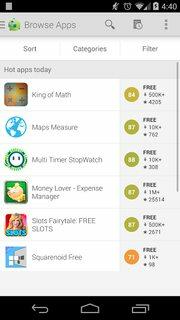 Has daily/weekly leaderboards of highest downloaded/rated apps. Aptoide serves a bunch of repositories in APT style (which some of you might know from Debian and its derivates). 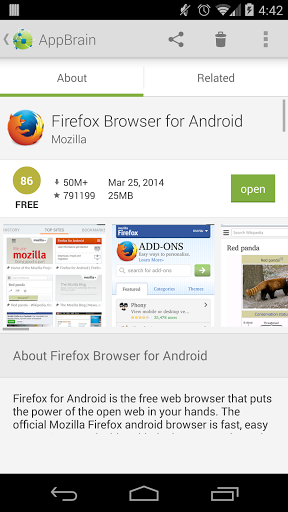 They also have their own Android client used to access (search and install apps from) them. 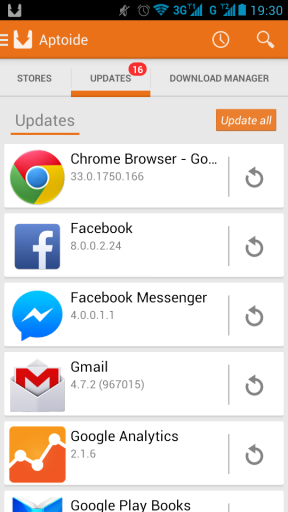 For checking available apps, any web browser can be used as well – simply point it to m.aptoide.com. According to Wikipedia, they serve more than 900,000 different apps with over 3.6 billion downloads in over 250,000 stores (as of 5/2017). 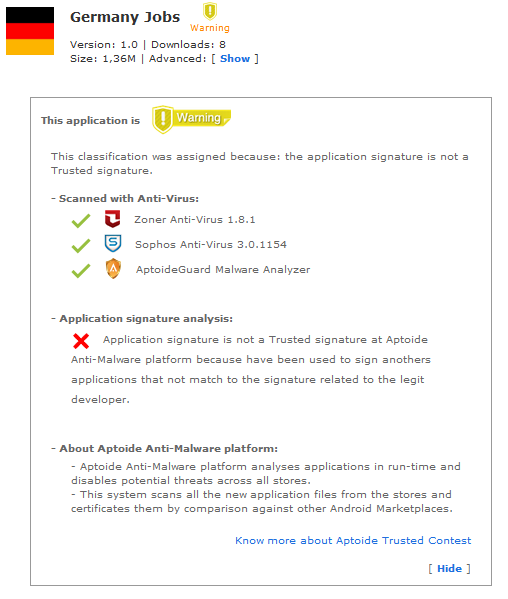 Like Google Play, Aptoide actively scans its repositories for malware. They're using 3 different malware scanners, doing signature checks, and having implemented a chain-of-trust based in the signature of the developers. They work with several universities and research centers to make and keep the environment as safe as possible. Privacy is considered a high value. 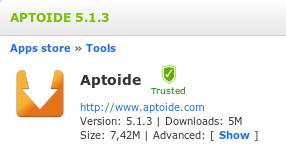 Aptoide is very cautious about the way they internally handle the user’s private information. we have a responsibility to assure that the apps in those stores do not harm the end user. In his mail to me, Paulo concluded: Believe we still can do better. Which to me indicates they don't settle on what they have achieved, but try to continually improve. If you additionally consider there's a company behind the "stores" which recently even filed an antitrust complaint against Google, that should be sufficient to deviate from associating Aptoide with "black markets" and "piracy" any more than Youtube – but rather consider it a good alternative (or supplement) to other Android app markets. you can have your own repository there – whether private or public. 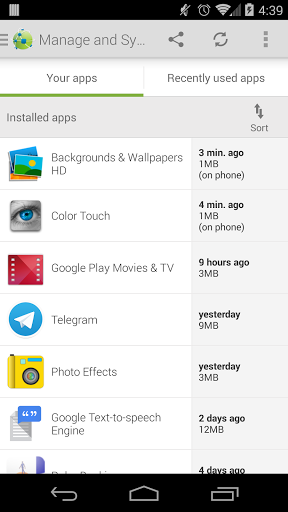 Their Aptoide Uploader helps you upload your apps there. 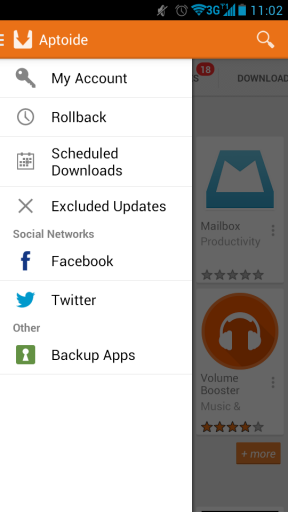 you can use a private repository to automatically backup your apps. 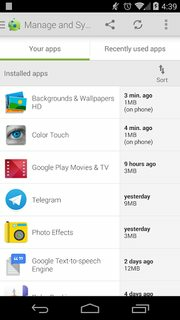 Their Aptoide Backup Apps is your helper for that. you can schedule installs/updates. Comes in handy when you're e.g. on mobile data, and just found a bigger app you'd prefer installing on WiFi. Just mark it, and when on WiFi toggle the "scheduled installs" (see third screenshot above). The Samsung app store is installed on every Samsung mobile device (which is lot). They are ultra helpful unlike every other app store I have submitted to. It can take over a week to get a new app past their quality control but it's worth the wait. They are so good at reviewing apps that I now submit to Samsung before Google Play. It can be a little confusing at first to understand what they call their seller office is all about but hey, we are developers so are used to learning curves. 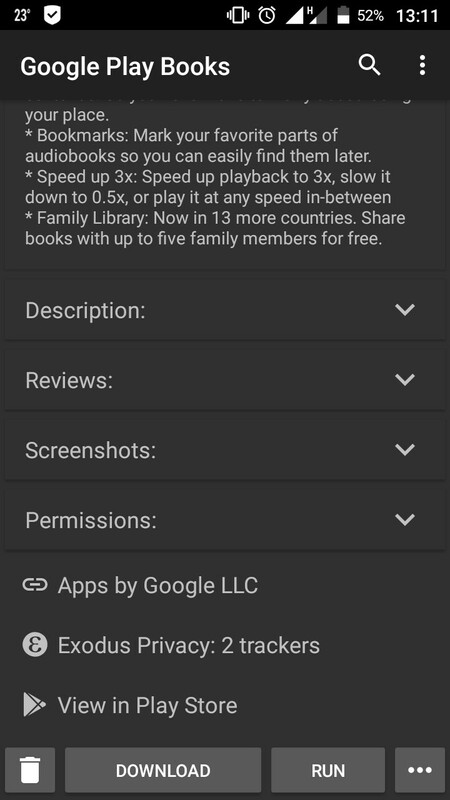 Among other things they review content to ensure that there are no copyright issues (something that can get you banned from Google Play) and they review every option VERY thoroughly on ALL the devices you have selected. If anything goes wrong and Quality control fails you get a complete breakdown of exactly what went wrong (including log cat) and even a video replicating the issue and they provide details on what is expected from you to fix it and re submit. What really impresses me is that they are so constructive with their criticisms. Once an app has been approved by Samsung I am more than happy that I have a very solid app that functions the way I want it to. I just get a comfortable feeling when Samsung approves one of my apps. They don't tell you off or slap you on the wrists or, in any other way treat you like a naughty school kid if you get something wrong. They just help you to understand what to put right. Google Play will just pull your app and suspend you with no help whatsoever to put things right. I recently discovered 1mobile.com, which appears to focus on free apps only. Their unique feature are app recommendations organized by topic as "app lists". Also, while they do offer an app for accessing their market, they also have direct APK download links on their website. I find them most useful when Google Play comes to the (wrong) conclusion that for unspecified reasons my device is not deemed compatible with some app. Caveat: I have no idea where they get their content from; I haven't found much in terms of developer support or an upload interface. They seem to carry pretty much every free app that's available on Google Play. Are they simply scraping Google's website? Are they legit? Soc.io Mall describes itself as more than just an App Store. It is a mall where you can have apps, games and e-books. Soon it will be enriched with audio books and music! Antiroid is an excellent website that will provide you with the corresponding free alternative to the paid app (that you may well could have purchased had you been unaware of this website). The Opera (as in web browser) mobile store has many Android Applications that are arranged by category. Providing another alternative for Android Users. Missing in previous answers is AndroidPIT which is running a separate market. Sure, almost all apps found there are also in the Playstore (but not necessarily vice-versa: so for missing apps there are links to the playstore provided). Developers need to actively maintain their apps on this platform (i.e. upload new versions), and for paid apps AndroidPIT provides its own license API. So what is the plus of this platform? It has an active community (in the forums and the news blogs), and one can use alternative payment methods (e.g. Paypal) in addition to credit cards. Moreover, reviews for apps can be found there as well. So with the playstore comments, local comments, and the reviews, one can get a better idea of what an app is like -- before downloading it. Furthermore, the German branch even has an App Reviews section in their forum, including overviews for apps on a kind of "per-category" base -- which makes it easier to find a suiting app, as similar apps are grouped together. So if you like that idea, but do not want another "source of apps" (it's a good idea to stick to one market platform, especially for paid apps -- so you don't lose track which app you installed from what source, and get into trouble on a re-install for a new (or factory-reset) device), you can still go there for information. 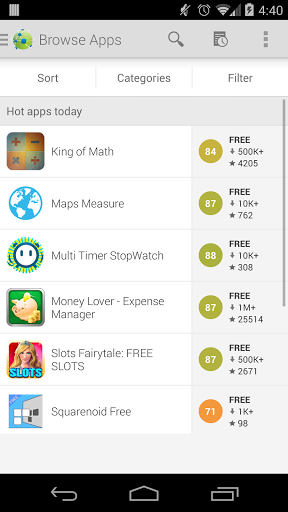 UPDATE: AndroidPIT has closed its independent app market on 2014-12-31. 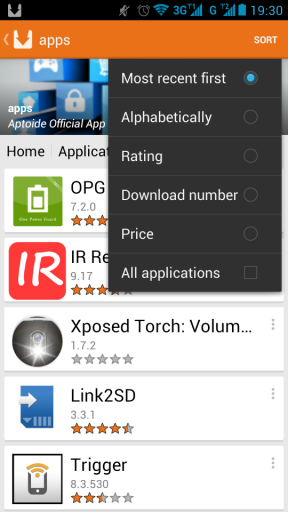 Yalp Store allows the download of apps directly from Google Play Store. By default Yalp Store connects to Google services using a built-in account, so you do not have to own a Google account to use it . The only reason to use a live Google account is to access the paid apps you own or leave reviews. Now Google is focusing on the educational side, offering a special version of its app store called Google Play for Education. (Initially applicable to USA only I believe). At launch, Google is offering Play for Education bundled with Google Nexus 7 tablets. In early 2014 the company plans to offer Asus Transformer Pad and HP Slate 8 Pro tablets as well. Though it's rather a "link only answer", in this case there's no way around as the given source is (hopefully) maintained and the content subject to change: Here's a list of available markets in the DMOZ Mozilla directory, also giving users the possibility to report issues with them (if any). In addition to those already mentioned in answers here, it also names e.g. Aptoide, AOpenSource – altogether at the moment of this writing 25 Android markets. I received very good amount of installs from mobiletoones.com and apps.opera.com. Also, my revenue was ramped up too within 2 days. If you are looking for targeted users for your app then you should distribute your app to many sources not just stuck to one website! AppsLib claims to be the application marketplace specifically for Android Tablets. Aurora Store is an open source fork of Yalp Store which provides a Material UI to the later. Aurora Store is an UnOfficial FOSS client to Google's Play Store, with an elegant design, using Aurora you can download apps, update existing apps, search for apps, get details about in-app trackers and much more. You can also Spoof your Device Information, Language and Region to get access to the apps that are not yet available or restricted in your Country | Device. Aurora Store does not require Google's Proprietary Framework to operate, it works perfectly fine with or without GooglePlayService or MicroG. Thereby avoiding the various privacy issues. Not the answer you're looking for? Browse other questions tagged applications alternative-markets or ask your own question. Is there a shop like Cydia on iOS for Android? Cruz T301: Where Can I Get New Apps? What are the official APKs sites? How can I download an APK file from the Play Store? How can I choose between Shazam and SoundHound? Are alternative, mostly Asian, Android Markets safe and fair? 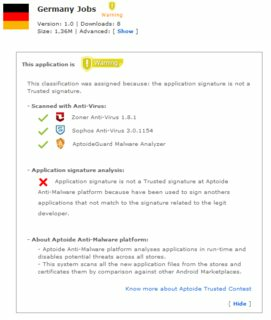 What are potential problems/violations that malware apps can do? Possible to estimate the number of users for an Android app? How to make alternative app markets perform automatic updates? Where are music files downloaded from the Google Play Store stored on an Android device? Why are there no GOOD video editing applications for Android? Why are apps on Aptoide newer than the Play Store?